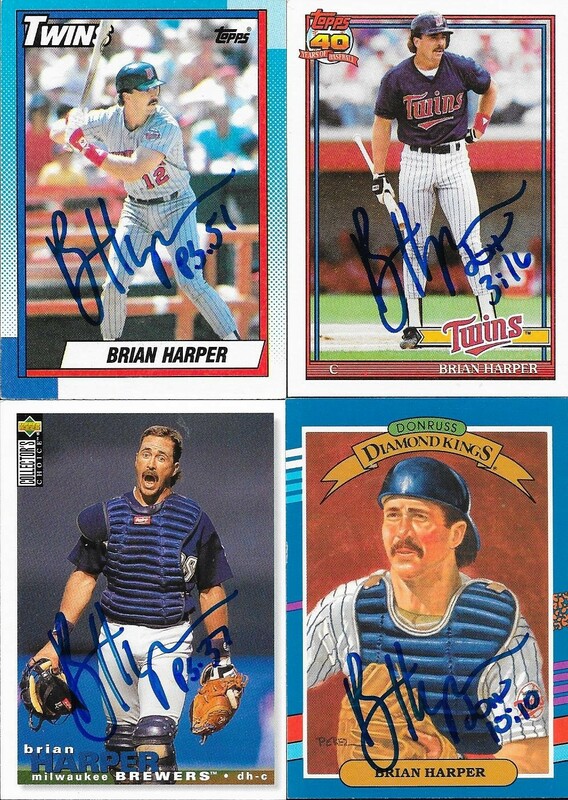 This TTM success from former catcher, Brian Harper, provided me with some really nice 90s gems for my binder. 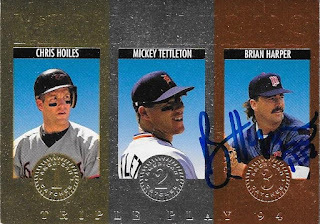 Although it might be hard to get the other two guys on the above 1994 Triple Play Medalists, I had to get this into my album. I remembered when these came out back then, and loved pulling them from packs. This was the era when a foil card was considered a "hit", so these were a big deal. This 1994 Upper Deck SP die cut also turned out really nice. It looks better in person that the scan shows. I wanted to add a few Topps cards to my sheet, so I picked the 1990 and 1991. 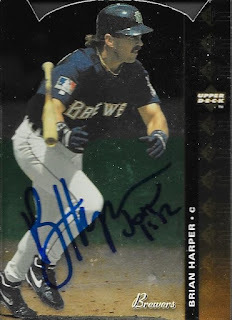 I liked the 1995 Collectors Choice because of the look on Harper's face, and really, I liked that set a lot back then. It was cheap and you could bust a ton of boxes looking for the gold signature cards. I also liked adding the 1991 Donruss Diamond Kings. Finally, any time I can add a 1991 Studio to the collection is a good time. These were really nice cards back then, and I don't see too many of them these days. Harper (b. 1959) played in the majors in 1979 anf then from 1981 to 1995 for the Angels, Pirates, Cardinals, Tigers, A's, Twins and Brewers. 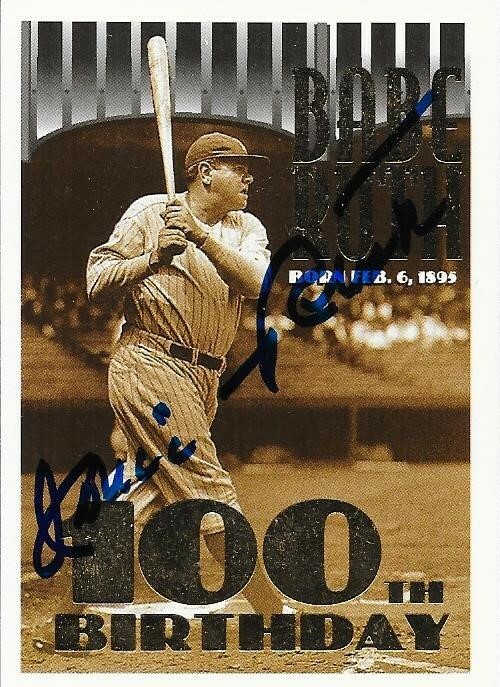 He had 931 hits, 63 home runs and a .295 batting average. He earned a starting spot with the Twins in the early 90s after toiling with other clubs. During his time with the Twins, he batted .306. He won the World Series with the Twins in 1991. I mailed to Harper via the Toldeo Mud Hens on April 3 and got the cards back on June 22, for an 80-day TAT. 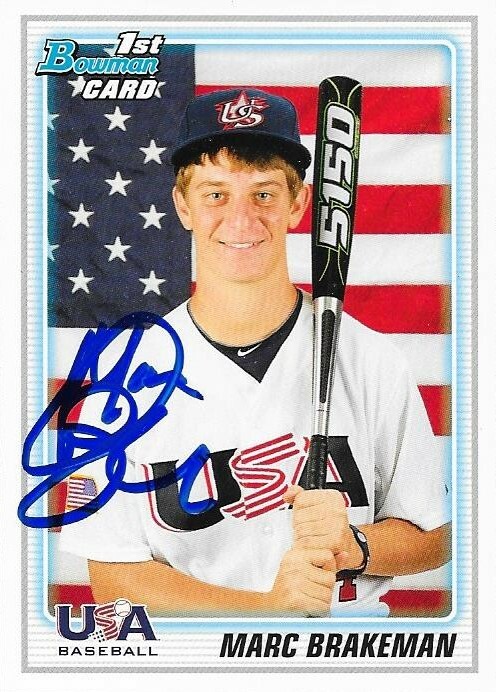 I have been sitting on a stack of 2010 Bowman Team USA cards since the 2012 National was in Baltimore. I went to that show with my friend, Ryan, and picked up a huge stack of these cards out of a dime box. I ended up dropping something like a dollar on the entire stack, and put them aside in my rookie box and waited to see if any of the kids made the majors. The Albert Almora, Alex Bregman and Corey Seager cards are nice to see now, but some of the kids in the set are now in the minors, and some of them come nearby. Marc Brakeman is with the Salem Red Sox, a Carolina League team that makes only one stop in Kinston, and that was early in the season. I was afraid I wouldn't see Salem again this year, so I asked my friend, Dylan, if he could 50/50 Brakeman for me. Dylan's home team is Salem, so he was happy to oblige me. 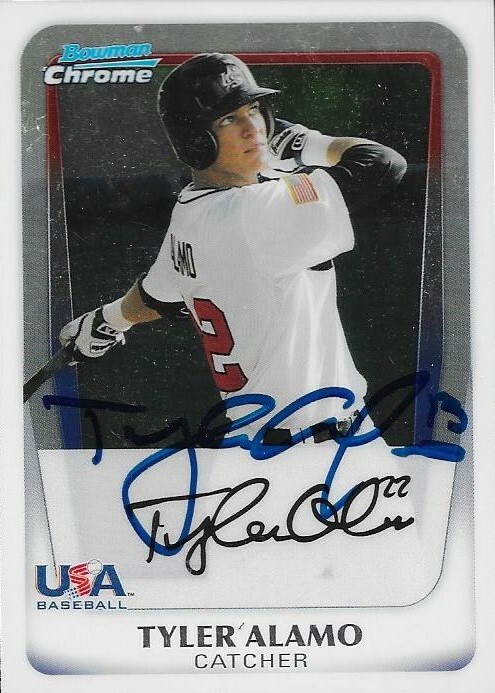 I now have this and a Cole Billingsley card signed. I was supposed to get a Bregman from someone who apparently worked out with him, but I no longer talk to that guy (a damaged card from his end in a trade, and some overall rudeness killed that relationship), so I doubt I will complete this set. Still, it is really cool to finally make use of these cards that have been in my box for 5 years. Thanks for the 50/50, Dylan! Ever since I have been able to graph the Down East Wood Ducks, I have had folks wanting to do some 50/50s here and there. A 50/50 is an agreement between graphers to send x number of cards to the grapher for teams that they will be seeing. 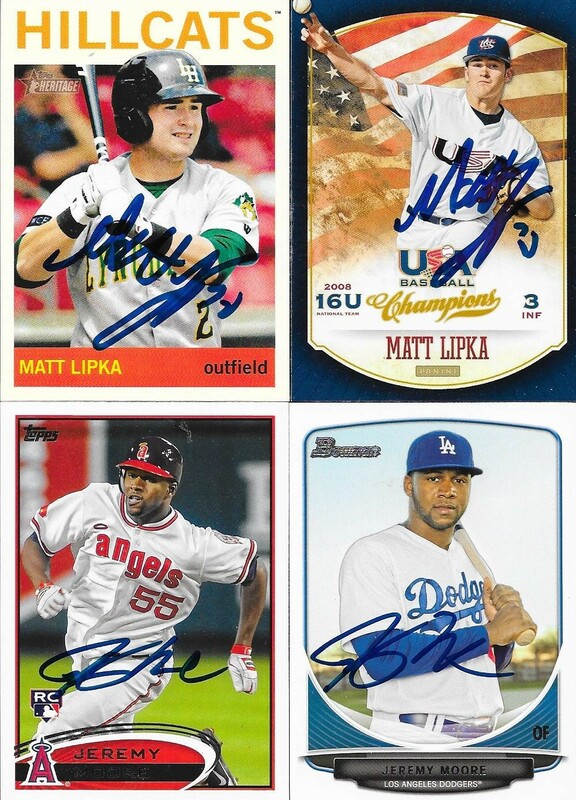 Grapher gets the cards signed. They can keep half of the cards for themselves, and the person providing the cards gets the other half in return. I have been doing 50/50s with Max for a while, but now, with the Wood Ducks in town, I have accepted and sent out a ton more. 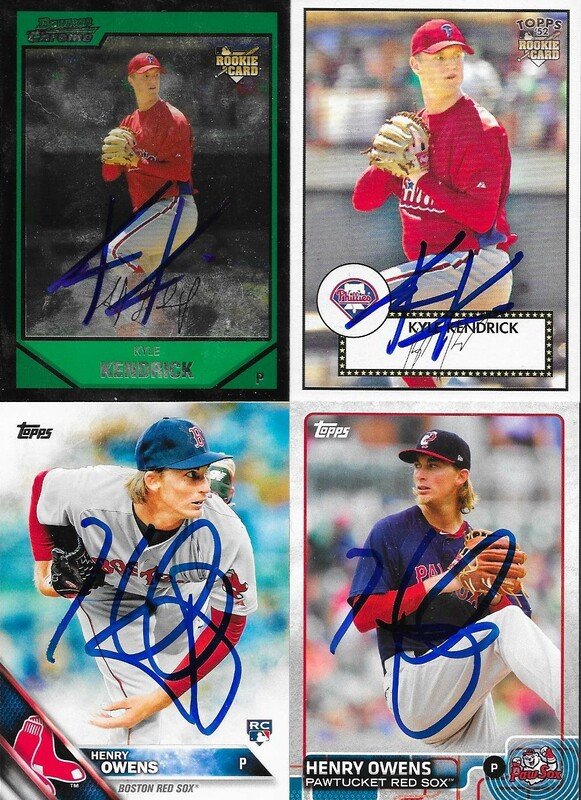 My good friend, Gerard, has sent me a bunch of cards for the Wood Ducks, but has also accepted cards of the Pawtucket Red Sox. 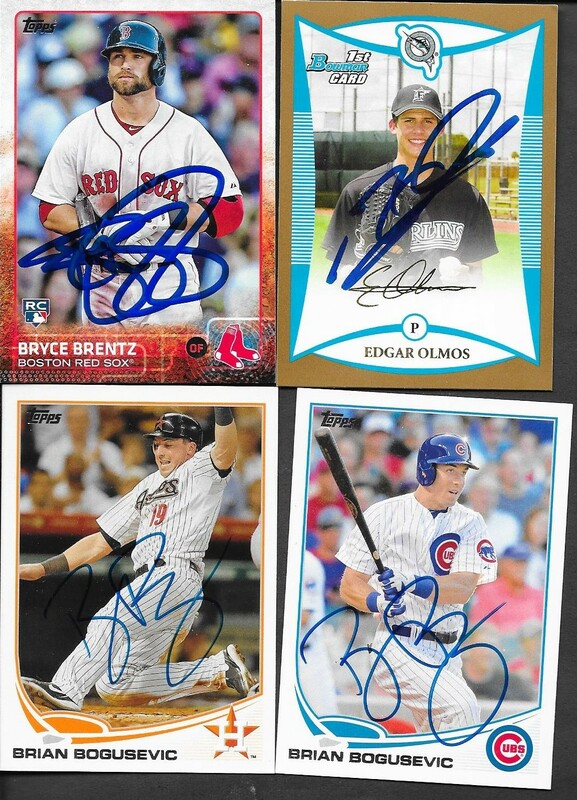 He sent me a huge package the other day with some of the results from his latest trip to a PawSox game. 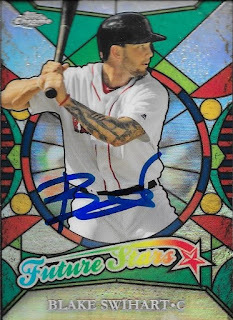 The above Topps Chrome Blake Swihart might be the best card of the bunch. This one looks so awesome in person. Pardon my cards slipping on my scanner. 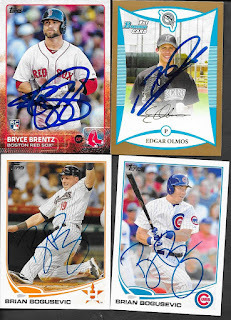 Gerard hooked me up with some nice autos on some more recent Topps cards. The Brian Bogusevic cards were really nice. I was able to get an extra Cubs one, and will pass that on to Max. 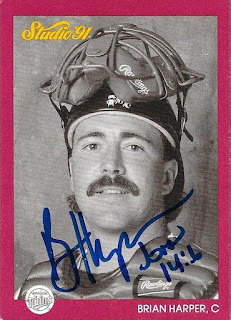 The 1987 Kipper adds yet another card from that set to the binder. 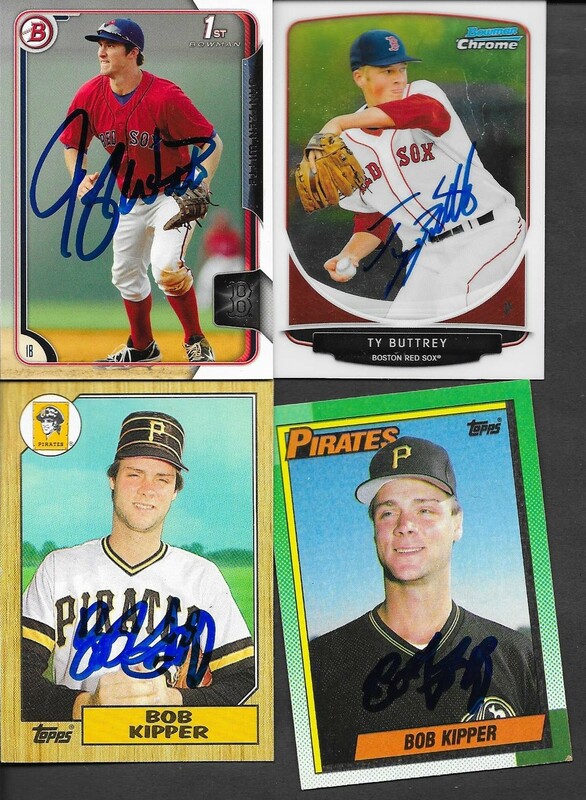 I had more Ty Buttrey in the past, but those ended up going out to a few Red Sox fans in the past. I really like 2015 Pro Debut, so I was happy that Gerard was willing to send that Henry Owens back to me. 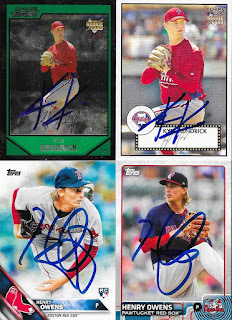 I thought I had more Kyle Kendrick, but I was only able to find four cards. Thankfully, one of the ones I got back was the Bowman Chrome. I have a ton of cards from that set, but haven't been able to get any signed, until now. Finally, I got some cards signed for Gerard at the Wood Ducks games a few weeks ago. Matt Lipka has been the hardest player that I have tried to get at Grainger Stadium. He had blown me off so many times, I'm starting to think he owes me dinner and a movie. Seriously, though, he is tough to get, so I had to wait around after a game to get him. I have 5 cards left of the 50/50, so I may wait around after another game soon, then not accept any more Lipka cards for anyone else. On the flip side of that, though, is Jeremy Moore. Moore is super nice, and my son, Chris really likes him. Moore (b. 1987) played in the majors in 2011 for the Angels. He was drafted out of high school in Louisiana in 2005. He appeared in 8 games for the Angels in 2011. He collected one hit and retired with a .125 batting average. Jeremy is a class guy and I always love chatting with him at games. Jairo Beras has since been demoted to Single A Hickory as he makes the transition to pitcher. He hasn't hit much since signing a nice contract out of Cuba, so the Rangers are trying his arm out. I hope he is successful. I have another batch of 50/50 cards that I am working on with Gerard. I hope they come out as nicely as these. 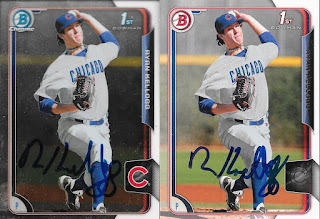 It is really tough for me to know which current players sign TTM, but thankfully, I have seen some successes on Instagram. Those successes have prompted me to send to a few guys, who I may not have tried before. I was glad to get this return from Cameron Maybin via the Angels. 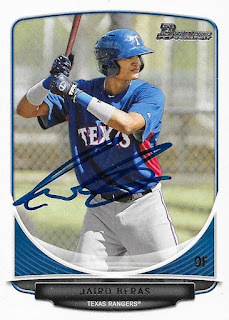 I regretted, however, that I sent too soon because I found a great card of him after I had already gotten these back, I might try him at Spring Training, then, to get that card signed (2016 Topps). Still, I added a 2008 to the binder, and now this set isn't the rarest in the album. I also added a 2017. I don't have many of these signed yet, but I think they will start filling in between now and next year's spring training. They look nice when signed, though. 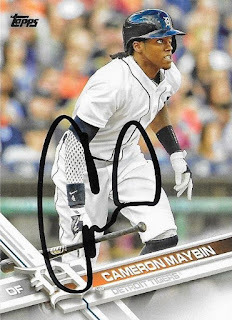 Maybin (b. 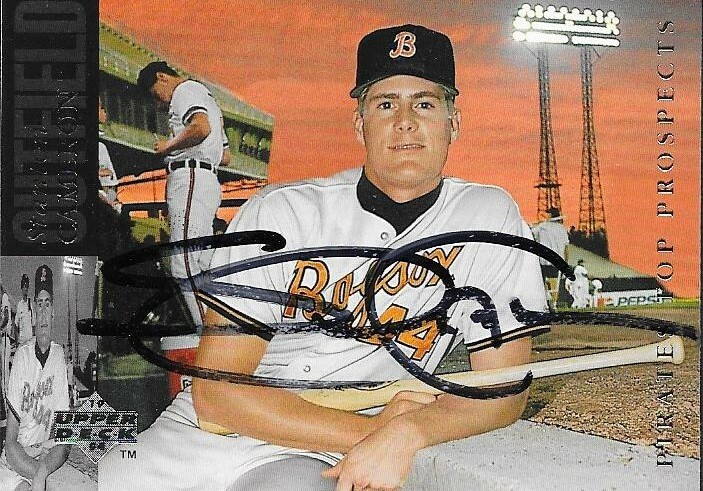 1987) has played in the majors since 2007 for the Tigers, Marlins, Padres, Braves and Angels. He currently has 765 hits, 52 home runs and a .259 batting average in his career. I mailed to Maybin on June 12 and got the cards back on June 22 for a 10-day TAT. 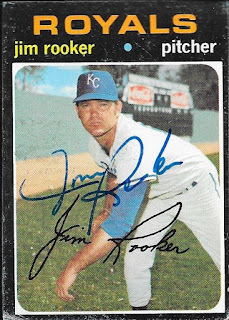 I got a few nice vintage cards with this TTM success from former pitcher, Jim Rooker. I don't have too many 1969 Topps in my binder, so adding this rookie stars card from that set was nice. I'll have to check and see if Mike Fiore signs. I like seeing 1971 Topps come in for some reason. This one turned out really nice, and I like the old scoreboard in the background. 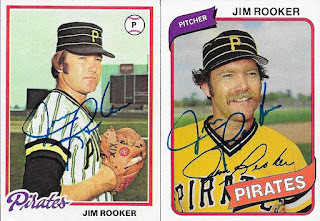 Finally, here are a couple later cards, a 1978 and a 1980 of Rooker as a Pirate. Rooker (b. 1942) played in the majors from 1968 to 1980 for the Tigers, Royals and Pirates. He had a career record of 103-109 with 976 strike outs and a 3.46 ERA. He won the World Series with the Pirates in 1979. 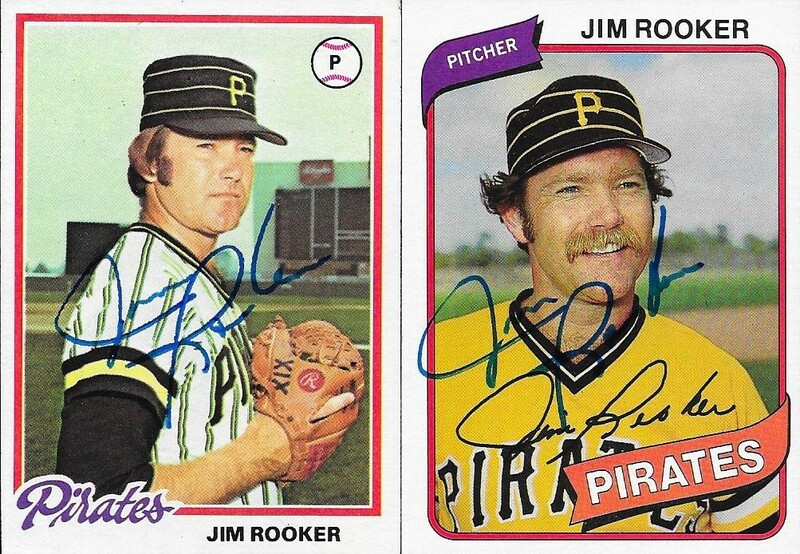 I mailed to Rooker on June 12 and got the cards back on June 19, for a 7-day TAT. This was a really cool TTM success with a card that I got from Andrew's little brother, Caleb. 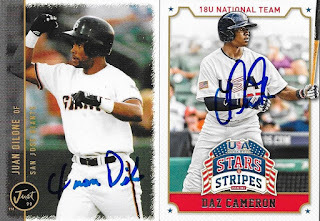 I got two signed cards back from Stanton Cameron, so Caleb will be getting one of them, since he gave me the card. I really liked it, since it has the awesome sunset in the background. Cameron sent a letter back with the card saying that the player shown on the back of the card is TR Lewis, and I should try to get him to sign it as well. I would, but it doesn't look like a current address for Lewis is available. Cameron (b. 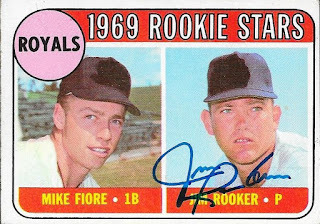 1969) never made the majors, and spent 13 seasons in the minors and independent ball. He spent two years in the Orioles system, between Frederick and Bowie. He retired from baseball with 972 hits, 167 home runs and a .269 batting average. 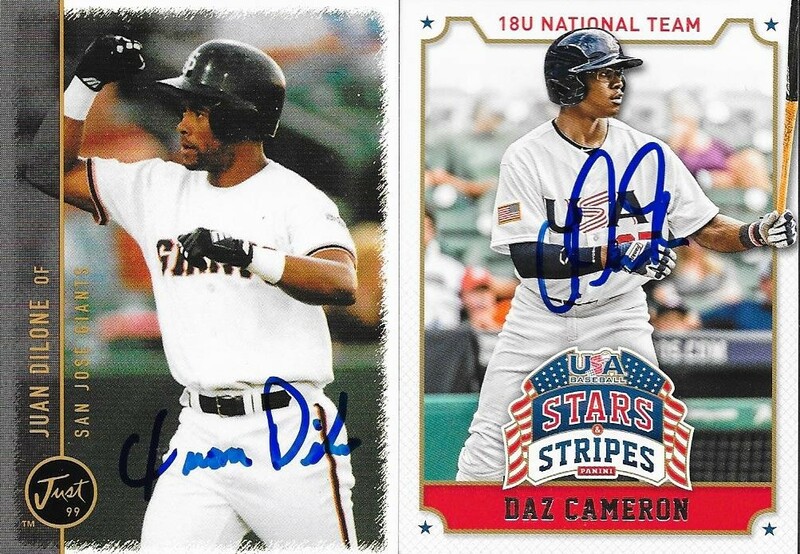 I mailed to Cameron on May 24 and got the cards back on June 19, for a 26-day TAT. My friend Cameron came into town for the weekend and we decided today that we would hit up a baseball game in the area. We went to the LCS and picked up a bunch of Durham Bulls cards, since they were the only nearby team that was playing at home today. As I was getting ready to head out the door, my good friend Brayden messaged me YOAN! It hit me that the Bulls were playing Charlotte, and Yoan Moncada was on the Knights. I had just pulled this /99 orange parallel out of my Series 2 silver packs and had been begging Brayden to get his buddy Moncada to sign it for me. Brayden is a great guy, but he is also realistic. 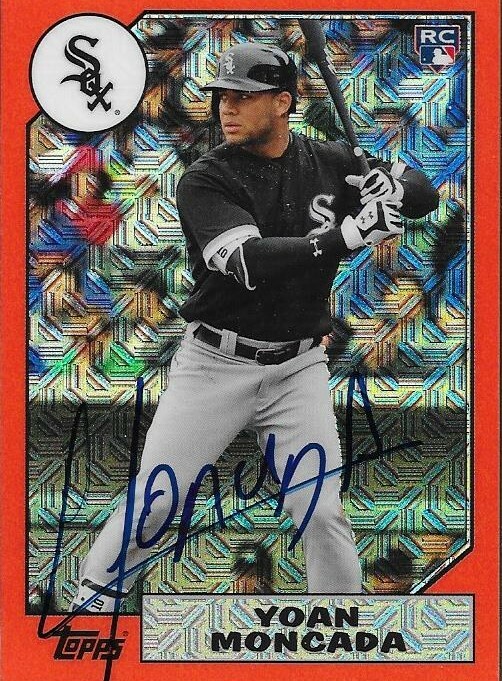 He lives in Texas, and isn't sure when he will be able to see Moncada again, so I was feeling like I might not be able to get this awesome card signed. 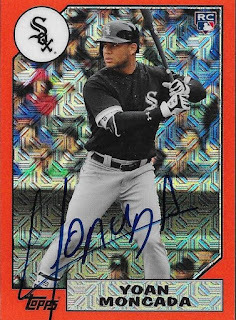 Thankfully, Brayden sent me a jolt to remind me, and I set about my mission to get Moncada on this card. Cameron and I watched along the 1 hour and 45 minute drive to Durham that the sky was getting darker and darker. Finally, as we got to the stadium, it began to rain. We waited by the visiting dugout, then it started pouring. We moved from our spot to one beneath the roof and waited for the rain to subside. When it got to a point where I didn't feel like the rain would be an issue, I went back to my post by the visiting dugout. Luckily, due to the rain, the other graphers had moved out, and I had a prime position to be able to get Moncada, should the game be played, and should he choose to sign. Then the power went out at the stadium. We waited and waited, as other graphers finally came and stood nearby. I looked across the field and saw that the Bulls had already filled their dugout. One of the graphers (a rare lady-grapher) was kind enough to tell me she would hold my spot by the dugout if I went to try to get a few Bulls. I walked over and tried for a few minutes, but none of the players were coming over, so I went back to my spot. I summoned Cameron over (he had continued to stay under the shelter) and recruited the poor guy to try to get a few Bulls for me while I tried to get Moncada. 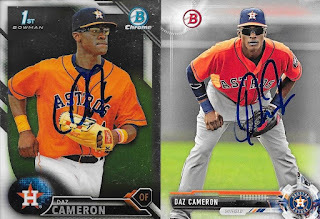 Cameron tried valiantly, but he was unable to get any Bulls autos. I'll have to 50/50 those cards with Dilan or Dugan. Finally, Moncada came out and I was the first person he signed for. I had two cards, but he was one per. I was ok with that, because the one he signed was my Orange. It looks awesome! I thank Brayden for reminding me that I would have a shot at Moncada, and believing in me that I could get the job done. 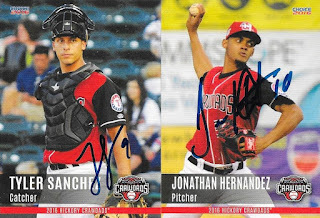 I tried to get a card signed for him, but since Moncada is one per, I was unable to. We ended up leaving the game early, since the Bulls were up 10-0 on the Knights, and the game had been delayed at the start. We ran into more rain as we were driving home, so this proved to be a wise move. The Bulls ended up routing the Knights, 17-3. 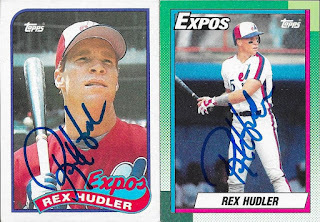 I added some nice cards with this TTM success from Rex Hudler. 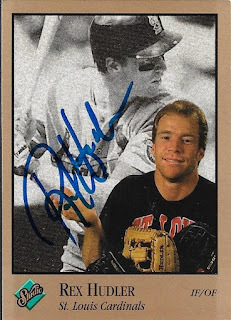 This 1993 Studio was a card I was really happy to see come back signed. Studio looks great signed. I added these two Topps cards as well. I liked the 1990 Topps because of the green hue. 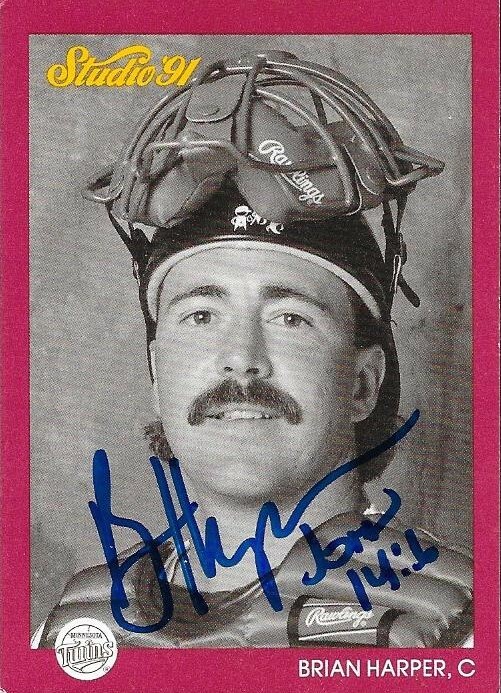 I have another green 1990 Topps coming in, and I had forgotten that I got this one as well. I love seeing 1992 Triple Play come back signed. This was the first product that I ever was able to buy a wax box of, mainly because it was really cheap. 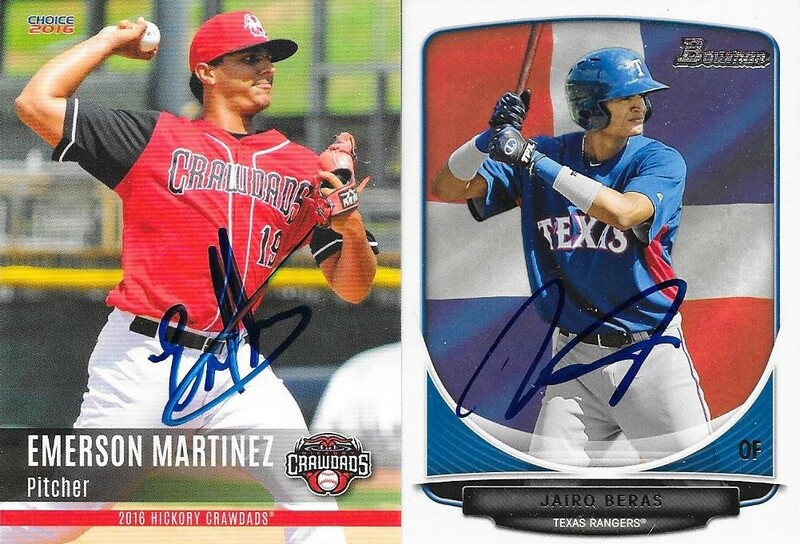 It isn't abad product, and the colorful cards look great when they come back signed. Hudler (b. 1960) played in the majors from 1984 to 1986, 1988 to 1992 and 1994 to 1998 for the Yankees, Orioles, Expos, Cardinals, Angels and Phillies. He had 461 hits, 56 home runs and a .261 batting average. 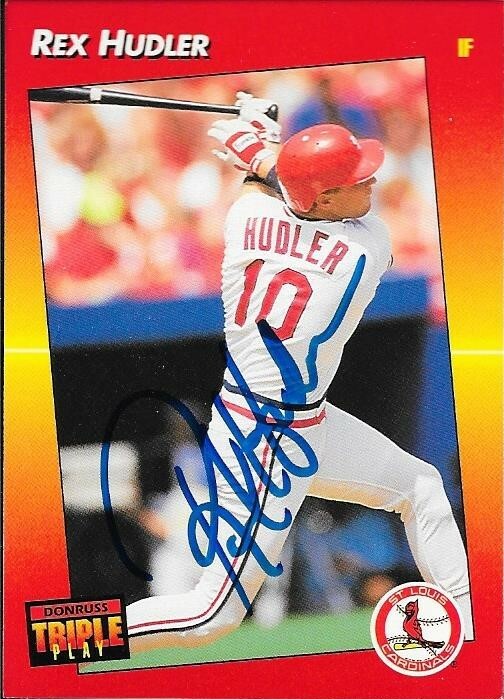 I mailed to Hudler on May 30 and got the cards back on June 16, for a 17-day TAT. I sent cards to my very good friend, Max, a few times to help him do some IP graphing around Chicago. 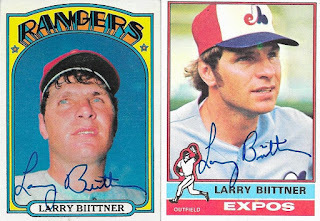 He had a paid session with former outfielder Larry Biitner and got these two cards signed for me. 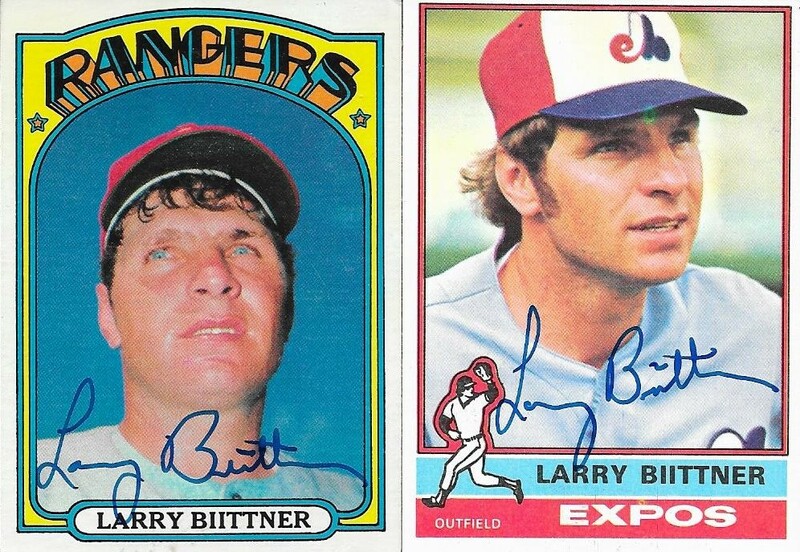 I raided my 1972 set for the card on the left and the 1976 on the right came out of my box from Columbia. They both look pretty cool, I think. I also sent Max some Orioles cards so he could 50/50 them while they were getting beaten by the White Sox in Chicago. 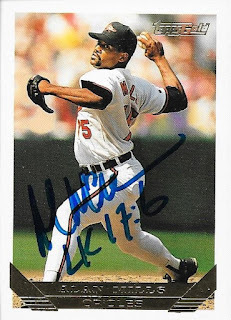 The only person who would sign for him was Alan Mills, and Max kindly sent me back all of the autos, which he didn't have to do. Mills and Roger McDowell had better find some magic cure for the Orioles terrible pitching staff, and soon, because their jobs might be on the line very soon. 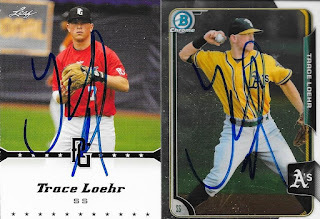 Finally, Max hit up a minor league game and got me some autographs from the Astros Single A team from Quad Cities. I sent him an assortment of Daz Cameron cards, and these are the ones I got back. He also sent me this Just Minors Juan Dilone to go along with everything. The Camerons came out really well. I have come to the realization that I really love the design on 2016 Bowman and Bowman Chrome. They look really sharp! Finally, I had found two Trace Loehr cards to send along to Max, and he sent them both back to me signed. 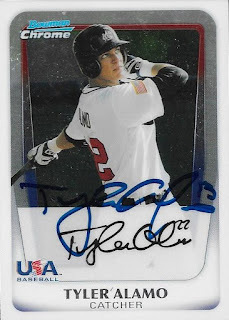 I was expecting him to keep the 2015 Bowman Chrome, but it came back as well. I had the Perfect Game cards for a while. I have wanted to pick up some more packs of it, but it is a pretty high price point, but there are guys in there who are graphing in the minors. Thank you so much for getting these cards signed for me, Max! I really appreciate it! 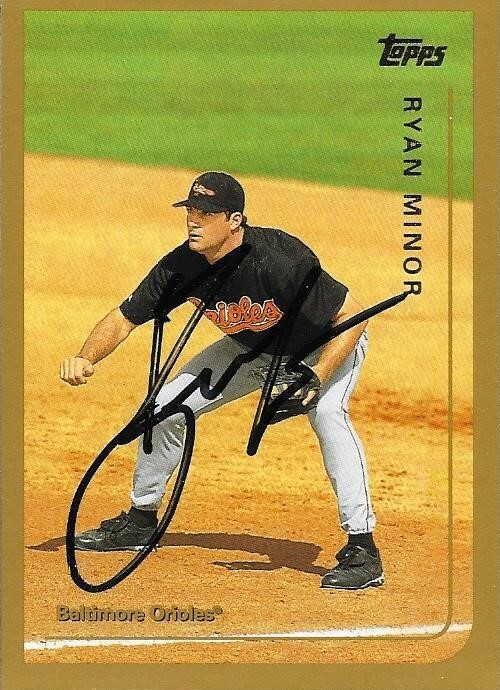 I added some cool cards of a former Oriole with this TTM success from Ryan Minor. 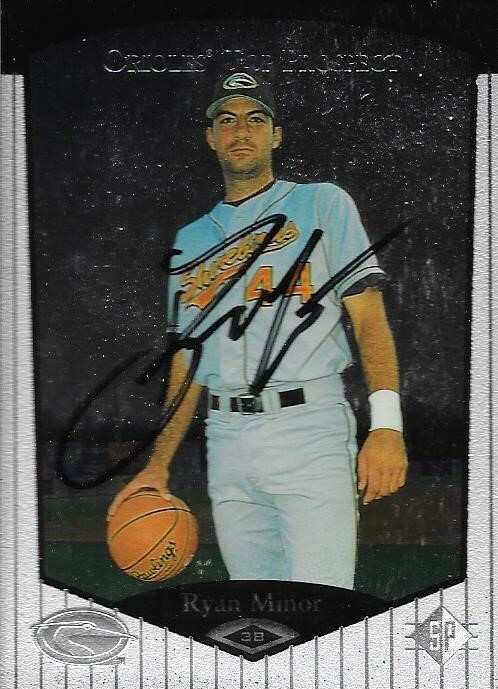 He is currently the manager at Single A Delmarva in the Orioles system. He was once a prospect for the Orioles, who's claim to fame was that he started at third base for the Orioles on the day that Cal Ripken ended his streak. 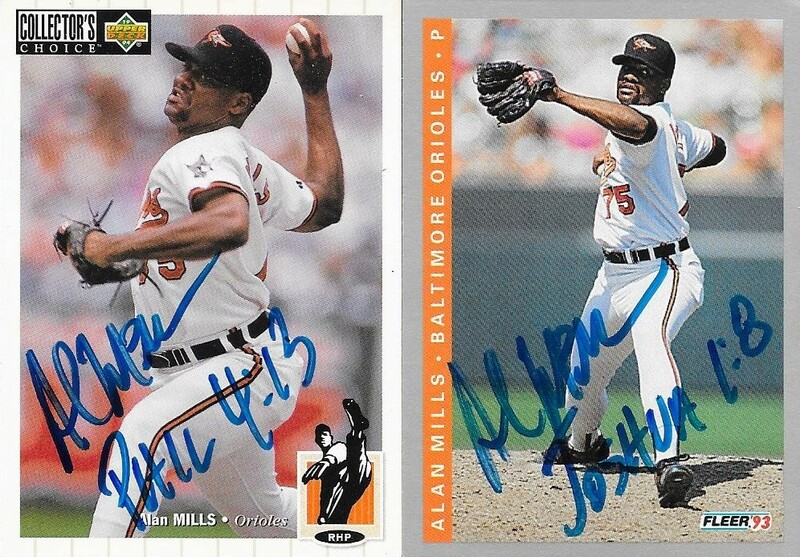 I had quite a few of Minor's cards in my Orioles box, so it was easy finding some to send out for the TTM request. I pulled this 1999 Topps out of the box I got while I was at Andrew's last month. I really like the 1999 Bowman set. Those are really cool-looking cards. 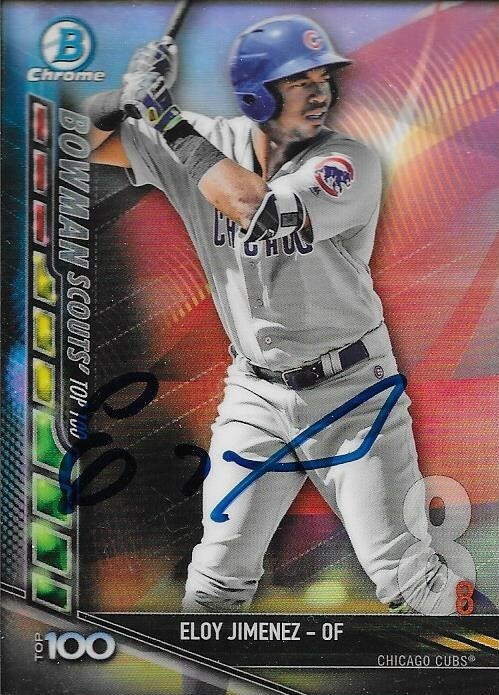 The Topps Finest turned out really nice, as well. Minor (b. 1974) played in the majors from 1998 to 2001 for the Orioles and Expos. He had 56 hits, 5 home runs and a .177 batting average. 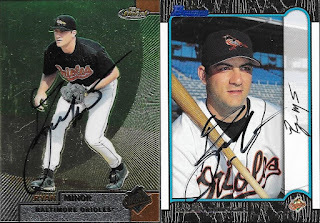 I mailed to Minor via the Delmarva Shorebirds on May 10 and got the cards back on June 15 for a 36-day TAT. Here is another example of a player who's cards I had for a long time before I finally got around to sending to them. 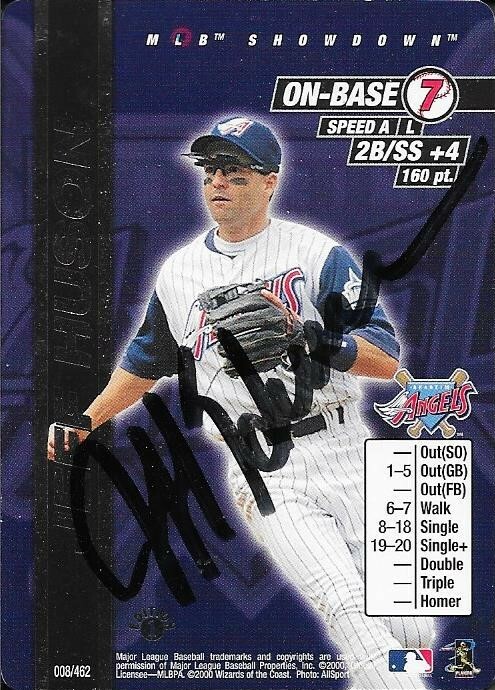 I really wanted to get this 2000 MLB Showdown card signed by Jeff Huson, so I finally sent to him. 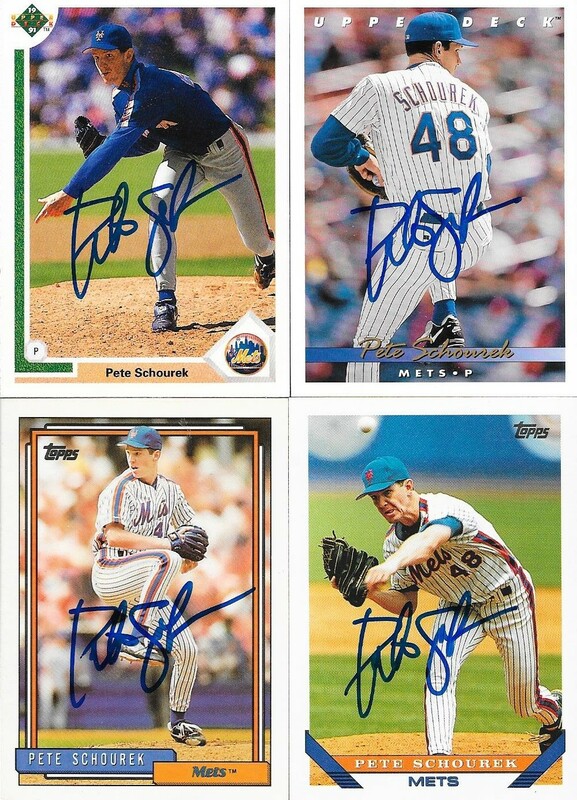 I waited long enough to have found a bunch of other good cards to send, so that made the TTM request that much better. I love the 1990 Score. It is like they switched the photo up and mismatched the border. I also like the 1992 Topps Gold Winners card at the bottom right. Those cards have made a comeback this year in Topps Archives. Huson (b. 1964) played in the majors from 1988 to 1993 and 1995 to 2000 for the Expos, Rangers, Orioles, Brewers, Mariners, Angels and Cubs. He had 439 hits, 8 home runs and a .234 batting average. 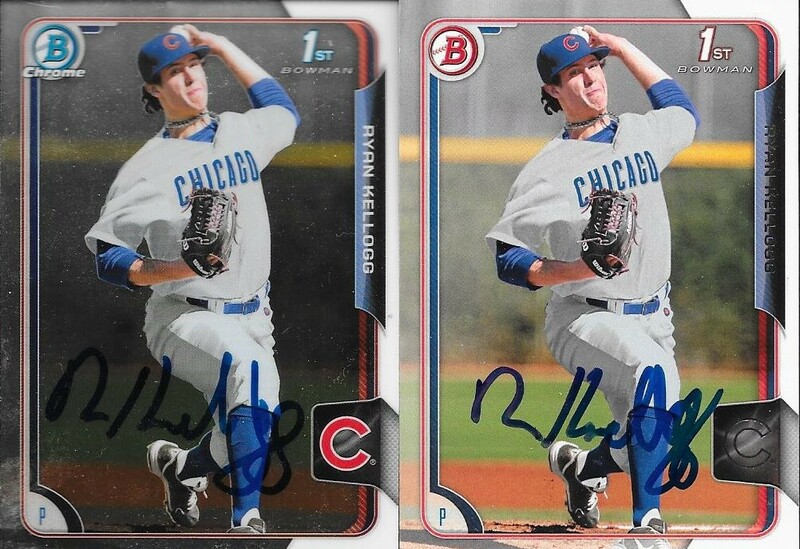 I mailed to Huson on May 30 and got the cards back on June 12, for a 13-day TAT. Sometimes, when I send out TTM requests, I manipulate them by putting certain kinds of stamps on the return envelopes, so I have a bit of an idea of what could be inside when it comes back. Today, it worked wonders, as I was able to call my wife into the room when I saw one of the three envelopes that was in the mail. Actually, the envelope was a surprise, as I had only seen two when I pulled the mail out of the mailbox. This one was stuck behind another, and I missed it initially. When I saw the banana split stamp and the post mark from Los Angeles, I had a pretty good idea what was in store for me. I called Mal into the room and showed her the envelope. When I opened it, I said a certain four-letter word followed by "YES". I had a TTM autograph of the actress who played my favorite character in my favorite movie. Jeanette Goldstein played Private J. Vasquez in the movie Aliens. I have been a fan of the movie since we got it on Fox Home Video way back a long time ago (probably 1986 or 1987). Mom was in some movie club, and I remember a bunch of Fox movies coming in all at once. Or so it seemed. Anyway, I always enjoyed the Vasquez character, especially her exchange with Bill Paxton's Hudson "Hey Vasquez, have you ever been mistaken for a man?" "No, have you?" She has a bunch of great scenes in the movie. When Paxton passed away earlier this year (#RIPBillPaxton), I thought I should really push to get Goldstein's autograph. I used the website fanmail.biz for her address, and sent the request via her talent agency. The card itself was something else I had to get done especially for this TTM request. I had met a comic book artist a few years ago at Comic Book day at the local comic shop. His name is Chris McJunkin, and I friended him on Facebook soon after meeting at the shop. 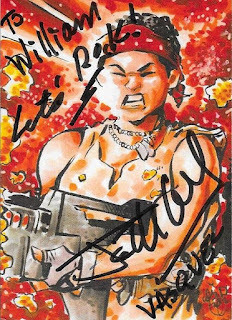 Turns out, he and I have a couple mutual friends, which is nice, but I contacted him to see if he had done any art of Vasquez and if I could purchase a couple that were baseball card sized. 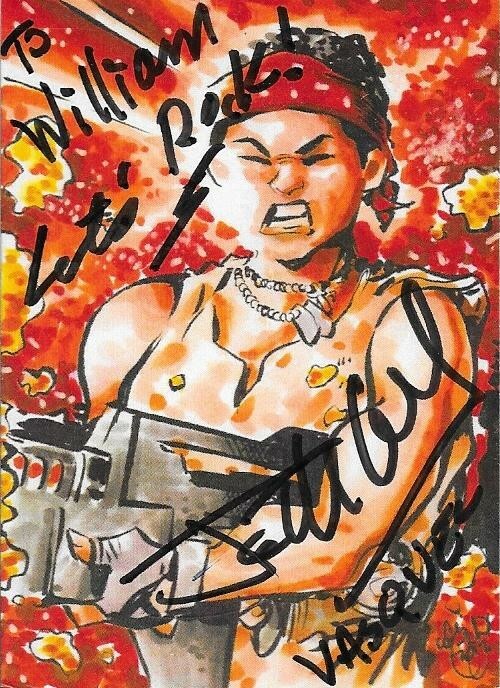 He had not done anything with Vasquez on it, so I had to commission him as an artist to create the card for me. I had no problem doing so, as I am a firm believer in artists getting paid for their work. He ended up hooking me up with extras (I commissioned him on a second work along with this one that is not yet able to be discussed... stay tuned), and I sent a copy of the card to Goldstein for her to keep as well (and she did). I mailed to Goldstein via her talent agency on April 11 and got the card back today, for a 69-day TAT. You can see Goldstein in action in Aliens, of course, and also in Titanic, Terminator 2 - Judgment Day and Near Dark. I went to three of the four games between the Down East Wood Ducks and the Myrtle Beach Pelicans this weekend, beginning on Thursday. I had some 5/50s to take care of for Weston, Billy, Max, Dugan, Andrew and Gerard. I also ended up with a bunch of extras, so my good friend, Brayden, will probably be seeing a care package soon, as well. 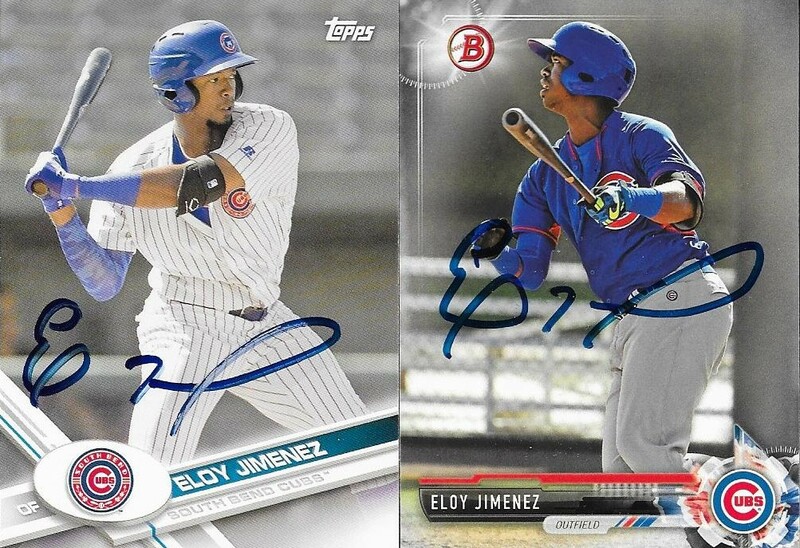 The biggest name on the Pelicans' roster is Eloy Jimenez. He signed one per, but I was able to get him both pre and post game at all of the games. I did really well, I think. I also had Chris helping me on Thursday, so that worked out as well. I've already pulled out all of the cards going out for the 50/50s. Max was a big help in getting me stuff from the Pelicans that I could get signed. They are a Cubs team, so he will be happy with the autos that he will be getting back. I met a father and son on Thursday who were graphing together, and they gave me a few Ryan Kelloggs, so I ended up with extras after helping Max with the 50/50. I skipped the Saturday game to go to the card show in Raleigh, which helped me replinish some of my Wood Ducks stock, and I also picked up a few Carolina League guys for future use. 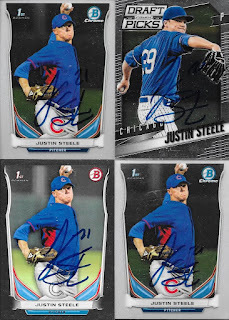 I also grabbed a couple more Jimenez and Justin Steele cards while I was there. 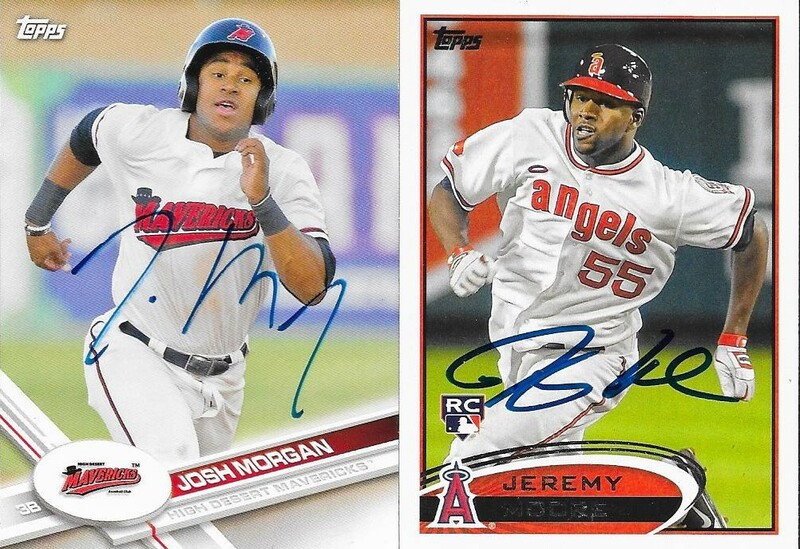 I continued to "rack" Josh Morgan and Jeremy Moore. I didn't get a chance to get Morgan's opinion on autographing multiple cards, but seeing him sign 32 cards between two people made me feel a lot better about my pages of four. There have been some recent call ups to the Wood Ducks, so I was able to get a few more cards signed from my Crawdads set that I bought. That reminds me, I need to look through Chris's set and make sure he has covered some of these guys as well. I spoke briefly with Emerson Martinez, mainly about a player (Zack Bird) who's card he didn't recognize. It appears that there are players who are listed on the roster who aren't with the team, and this comes as a surprise to folks who actually are on the team. It was kind of a funny, but helpful moment. 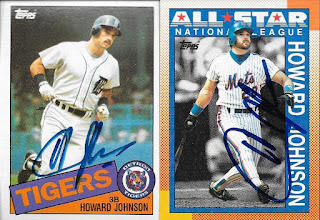 I was able to add two new Topps cards to my ledger with the 1985 and 1990 All Star shown above. 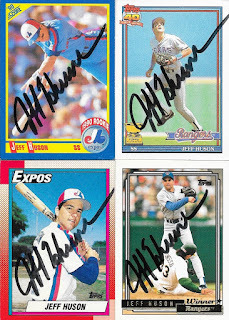 I was able to get some nice HoJo cards signed. He is only doing two-per as of late, but that is fine with me. 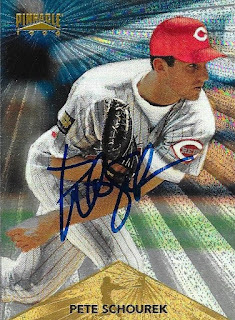 Bobby Rose has been away from the team, so I am still sitting on some cards of his to get signed. I hope I can get moving on them soon. In all, here is how I did: I got Howard Johnson x 12, Josh Morgan x 24, Chuck Moorman x 1, Tyler Sanchez x 1, Jeffrey Springs x 1, Jeremy Moore x 10, Jairo Beras x 4, Brett Martin x 1, Emerson Martinez x 1, Jonathan Hernandex x 1, Justin Steele x 8, Ryan Kellogg x 7, Tyler Alamo x 2 and Eloy Jimenez x 6. 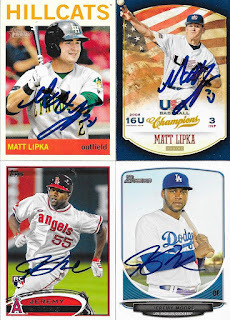 I also got Matt Lipka x 4, but those are pending Gerard's approval of what goes and what stays. So, I ended up with 79 signed baseball cards. 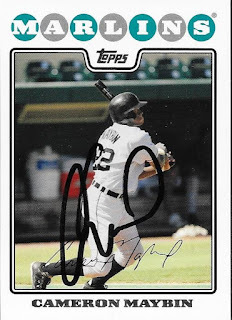 I gave away a bunch of my extra Josh Morgan cards to some kids who were standing there wanting autographs, so they could at least come away with something. I traded for a 2017 Pro Debut with Colin and his dad, then they gave me a handful of blank ones that I could get Morgan to sign myself. I was glad to get those, because Pro Debut has been tough to find. I am now taking a few nights off from graphing, and searching boxes. This past week has been exhausting with all of the 50/50s I have been working on. 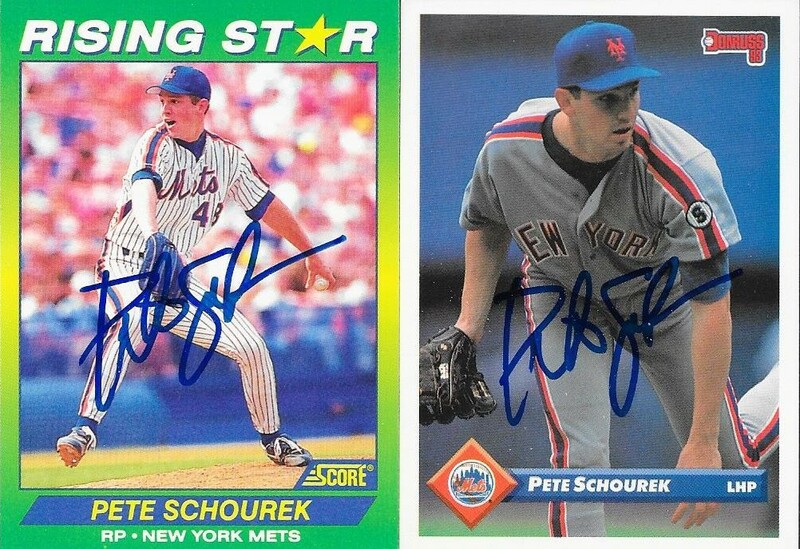 I sat on these Pete Schourek cards for a long time because I kept finding him in my card boxes and figured I would wait until I had plenty to choose from. I did get a nice stack going, and used them to populate a few sets that might be a little under-represented in my albums. This above 1996 Pinnacle Museum was the one card that I really wanted to get back. It turned out great. The 1992 Score Rising Star turned out really nice, as well. 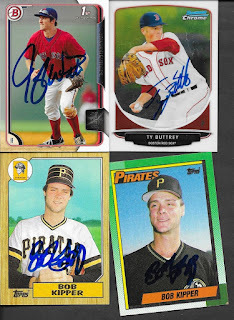 It will be a colorful addition to the album, as I see that I ended up choosing mostly white bordered cards for this TTM request. Maybe I should have thought that through a little more. I did like the 1993 Donruss due to the Mets jersey, though. 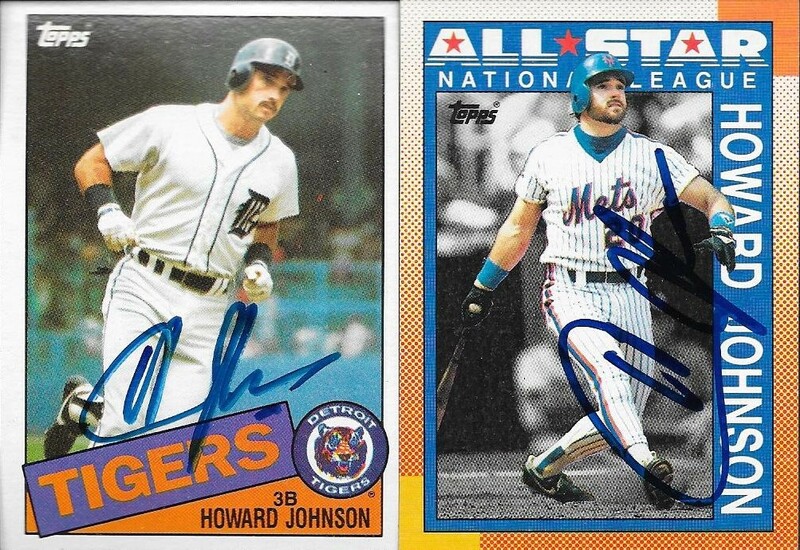 I wanted a couple Topps cards, as usual, so I included the 1992 and 1993 on the bottom. 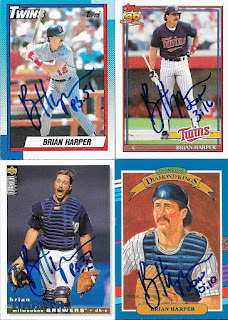 I also don't have very many Upper Deck represented in the albums, so I used this opportunity to get a 1992 and 1993 Upper Deck signed. They usually aren't my first choice to get signed, but they look nice, I think. Schourek (b. 1969) played in the majors from 1991 to 2001 for the Mets, Reds, Astros, Red Sox and Pirates. 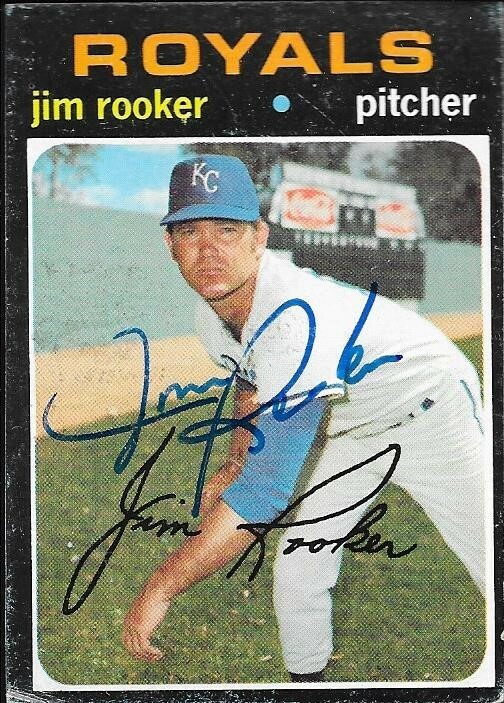 He had a career record of 66-77 with 813 strike outs and an ERA of 4.59. He had his best season in 1995 with the Reds, where he went 18-7 with a 3.22 ERA. He finished second in the NL Cy Young Award voting that season, and also was 20th in the NL MVP voting. 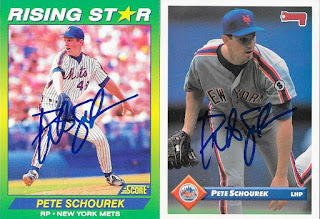 I mailed to Schourek on May 9 and got the cards back on June 10, for a 32-day TAT. I took last night off from the blog because I went to a second Wood Ducks game in a row this week and was really tired when I got home. I haven't gotten many TTMs in this week, so I am not falling too far behind, either, so it's ok to take a day off. Still, I wanted to get this TTM success from Del Unser in, since I got some nice cards as a result. I got the 1980 Topps 1979 Season Highlights card at the top signed along with the above 1976, 74, 78 and 80, and the below 1981. 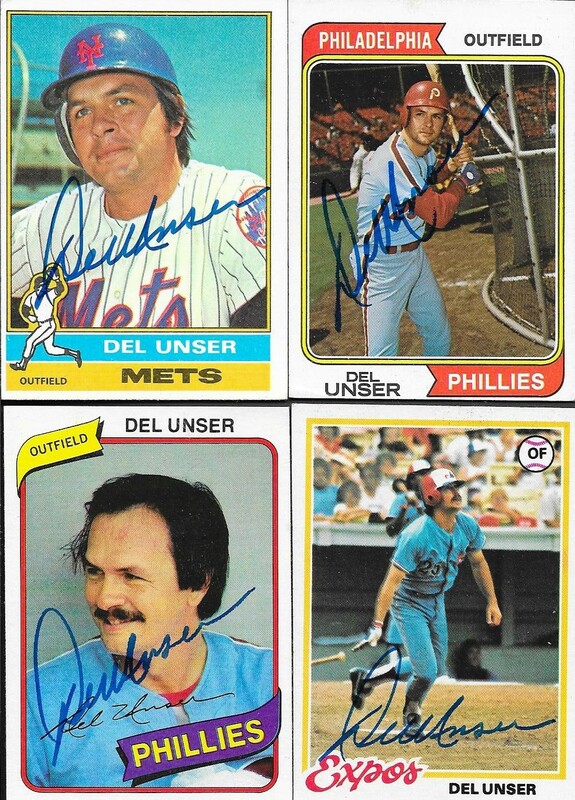 They all look great; Unser has a really nice signature. Unser (b. 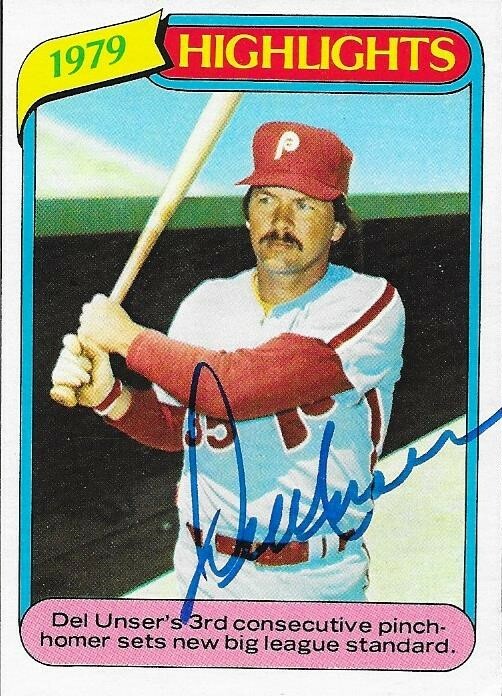 1944) played in the majors from 1968 to 1982 for the Senators, Indians, Phillies, Mets and Expos. 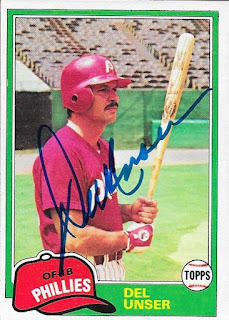 He had 1,344 hits, 87 home runs and a .258 batting average. He won the World Series with the Phillies in 1980. 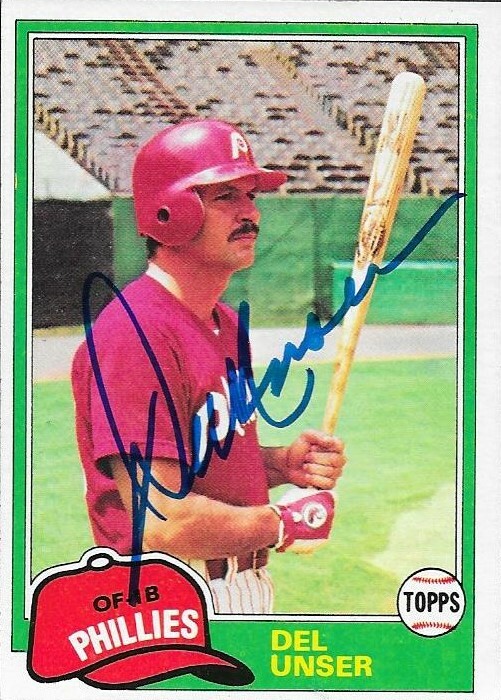 He finished second in the 1968 AL Rookie of the Year Award voting to Stan Bahnsen. He received MVP votes in 1969, finishing 23rd. 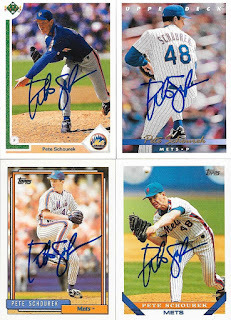 I mailed to Unser on May 10 and got the cards back on June 10, for a 31-day TAT. A few weeks ago, I posted a TTM success from David Mantle, son of Mickey Mantle. I also have received a TTM success from Rachel Robinson, widow of Jackie Robinson. 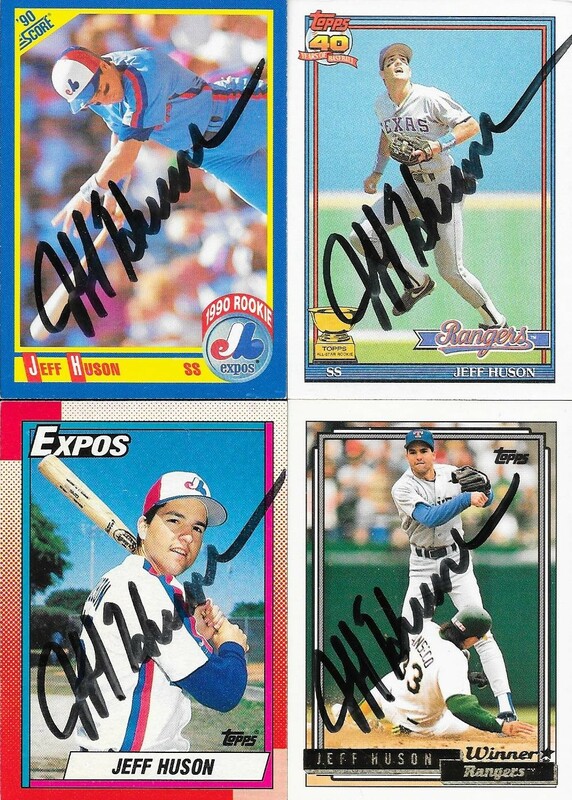 I thought those were really cool TTM successes, so I decided to try my hand at adding another, with Julia Ruth-Stevens. I mailed via the Babe Ruth Museum and got two 1995 Topps cards back signed. This was one I was really excited about, and am happy to see it come back. Ruth-Stevens was adopted by Babe Ruth in 1929. Ruth-Stevens celebrated her 100th birthday on July 7, 2016.